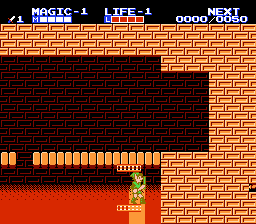 NES Zelda II: The Adventure of Link (USA) "warp glitch" in 06:16.93 by Gigafrost. Dark Link, the final boss, takes the same amount of damage no matter what level attack you have. This is especially convenient for Gigafrost because he reaches Dark Link without ever leveling, or, indeed, even killing another monster. Most of this run features Link racing across Hyrule so fast that the screen can't keep up, inexplicably warping between places that shouldn't be connected, and collecting just three items, one spell, and one sword technique needed to beat the final palace.